Mercure Hotel Remscheid. Book your hotel now! Free Wifi! The 4-star Mercure Hotel Remscheid has 116 rooms, all with free WIFI and most with air conditioning. Proven quality for business and private functions of up to 120 people. The conference area has seven rooms with the latest event technology. If arriving b y train, travel to Remscheid-Lennep - the train station is 1.2 miles (2 km) from the hotel. It is 30.5 miles (49 km) to Cologne/Bonn airport. The A1 highway is just 547 yards (500 m) from the hotel. For many, Remscheid is known as a tool-making city, but for generations the local economy has been characterized by an impressive level of innovation that has made many companies from this city global market leaders in their fields. 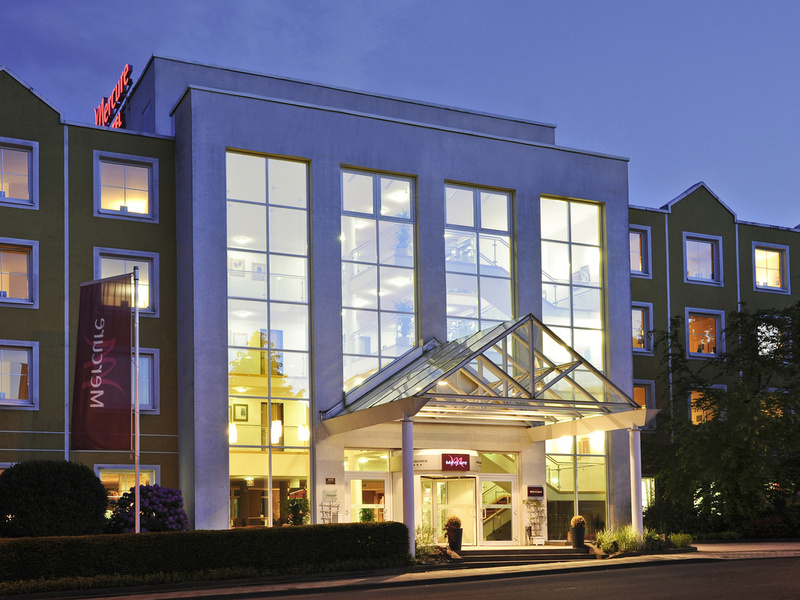 The 3-star Superior Mercure Hotel Remscheid has 116 comfortable rooms, the majority of which have air conditioning. Whether you choose a Single, Twin, Double or Privilege Room, free WIFI and a refreshing water are included. A child aged up to 12 years may stay in your room free of charge, and we will offer you a discount of 50% on a separate children's bedroom. Of course, your pets are also welcome in our hotel. Indulge yourself in our large selection of international dishes at the Mediterranean-themed Olive Tree restaurant, open daily from 6.30am until 10.30pm. You can even enjoy our dishes on the terrace in fine weather. Our lobby bar serves freshly prepared drinks and a fine selection of wines: the Grands Vins Mercure. The staff was very friendly in receiving me however the whole hotel is really run-down. The rooms need a full rehaul, as well as the stairs and entrance lobby. The room(410) was a little run down. But clean and with good beds. Appreciated the stay in the hotel, excellent staff (professional and friendly), nice rooms (clean, well equipped, enough space to move around), calm (no street noises). Only less positive remark - walls don't protect from noisy neighbors, loud TV passes through walls and slamming doors make walls vibrate. Room was cold & there is rarely English Breakfast tea prompting me to take my own. Everyone was friendly and helpful. Room was clean and bed comfortable. Friendly staff. Super preparation with tourist brohures. Terrible smell from bathroom in both rooms - I simply do not understand, how you can put people in rooms smelling so bad !!!! It was absolutely sickening. We did not complain - too tired, but again, how can you even think of using rooms with a smell like that ? Not possible to have window open due to draft between window and hallway (under the door to the hallway). Lots of noise from the draft. Apart from the twin bed rooms, all the other rooms are amazing in Mercure. The service, breakfast, price, everything is good. Home from Home or as close as it gets. I am so pleased that I choose the Mercure Remscheid as my hotel of choice for my recent business trips. when you are working away from home weekly for 3 months or more you need somewhere that needs to feel like a second home. The Mercure met this criteria, with a friendly atmosphere and staff comfortable rooms and where going the extra mile is never a problem, even to the point of cooking you your own favourite meal even if not on the menu. Well done to the Mercure Management and staff for making these trips homely ones. Great hotel to stay. Very comfortable and clean. Comfortable and ideal for short business trips. Quiet and all you need for short stays. Staff very pleasant and helpful. Good food but limited menu. We were in your hotel with a group of 40 people going back to Denmark. We had a good evening with dinner served by kind but very busy staf. Breakfast was super. The hotelroom was clean and very nice but we had some truble making the aircondition working. Simple things like no English Tea Bags available, menu items advertised but not available, air conditioning that does not work or is noisy. Water not always available in the room. Great breakfast and dinners. Laundry service was very disappointing. Took 5 days to get my clothes back. This service should be same day or the latest next day. Another surprise, had to pay for parking in such a small town. The amount I felt was quite high. Hotel is well placed near the Motorway but not in a very attractive area. The nearby town presents little in the way of restaurants and shops. I liked the hotel, the staff were pleasant and smiling. The room was fairly standard. I would have appreciated more electrical sockets, accessible on both sides of the bed.